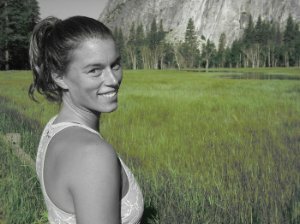 Join Erica for her nature inspired yoga classes for all levels at Kiva Beach in South Lake Tahoe every Wednesday at 8:30 am. Yoga in the sand helps bring back that childlike playfulness to make us nimble, happy and grounded to start the day. In fact, practicing yoga on an uneven surface such as sand helps with balance and helps to build secondary muscles in your feet, hips, knees, and shoulders. Yoga outdoors can also help you connect with something bigger than yourself. Like many of us, Erica got into yoga after years of pushing her body to the limit by running, snowboarding and biking. It finally caught up with her. She says that she had never been super flexible and did not stretch enough through the years. As a result she started having major back pain. Yoga was the cure. Yoga has helped Erica balance her life in many ways. She has improved flexibility (mentally and physically), her back pain is rarely noticeable, and she says she’s a happier person overall and more grateful than ever in life. 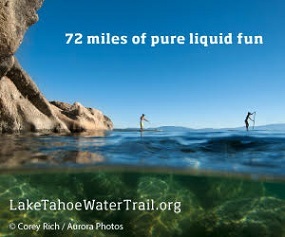 “I believe that a lot of us in Tahoe are very strong, intense, athletic people. Yoga is a great way to calm the mind and the body, bring more fluid movement to the body, and just an excellent addition to life.” says Erica. Erica invites all levels, and the yoga classes are free, but donations are always welcome. Please bring a towel or blanket. To join Erica, please park in the main Kiva Beach lot and meet on the sand on the west end of Kiva Beach near Taylor Creek. 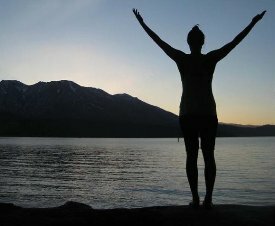 Be ready to embrace the elements and get grounded with Lake Tahoe as your center. If you have any questions, please contact Erica Hartnick, 200 RYT, and ehartnick@hotmail.com or 503-515-3088 (Notice 503 not 530). I grew up in Nevada City, CA in the Gold Country and foothills of the Sierra Nevada. Every summer my mom would bring us to Kings Beach for a week or two. It was the highlight of my year. Tahoe is part of me. I moved to Squaw Valley in 2003 and lived there for a couple years, then traveled awhile and moved in and out of other places such as Jackson Hole, Mt. Hood, Alaska, Maui, Half Moon Bay, but always seemed to end back in good ole Lake Taho-E. I moved to South Lake Tahoe in 2007 when my boyfriend and his brother bought a little fixer upper cabin and we have decided to make Tahoe our home base. (We still travel and roam a lot). I, like many people in the region have had many different jobs, doing whatever it takes to live in this magical place while enjoying the outdoor beauty. I have mainly worked in restaurants and hospitality, and have worked a variety of jobs including Snowboard Instructor, Marketing as well as being a Substitute School Teacher. I am also a current sponsored athlete for Carve Designs. In March 2010, I completed a Yoga Teacher Training program in Baja, Mexico and now am ready to share my great experiences with yoga with others. I am ready to give back to the great community of Tahoe and would like to spread my passion with others. My other interests include backcountry snowboarding, hiking, biking, surfing, dancing, gardening, yoga, and travel. Positive good people! Natural beauty. Magnificent lightning. Water. Wind. All the elements. Life itself. Changes all the time:) I love Kiva Beach and feel great energy there. Mountain Yoga in the Tahoe Keys is an amazing business with amazing people.